Everything DiSC® Management increases effectiveness using personalized learning to help managers develop their management styles, improve communication and increase employee engagement using the power of DiSC. Combining an EPIC-based pre-work assessment, classroom training, and all-new video, Everything DiSC Management is a complete management training experience. The new, research-validated 79-item EPIC assessment, creates an all-new 26-page management-specific personalized report that helps managers to understand themselves, their employees, and their boss. Customize the profile in EPIC by removing or rearranging pages, customizing the report title or printing only selected sections. 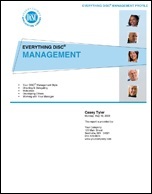 Everything DiSC Management Profile is sold separately and can be used with the facilitation or with your own materials. Six one-hour modules of fully-scripted facilitation with engaging experiential and processing activities bring the profile and video to life. MS Word format allows you to create and save a custom solution for every session. Modular design makes it easy to fit any timeframe, from one-hour to full-day. More than 30 contemporary video vignettes with real-world, management-specific interactions show how DiSC styles affect managing. Pick and choose clips that fit your needs. Video can be used three ways: as standalone clips, integrated into the facilitation PowerPoint, or integrated into your custom PowerPoint presentation. Everything DiSC Sales requires Windows XP with PowerPoint 2003 on a Pentium 4 or AMD Athlon (1.4GHz or faster) with 1GB of RAM. Facilitation, video, PowerPoint, and participant handouts come on a USB drive with ample space to save custom programs in one spot. “DiSC”, “Everything DiSC”, and “Everything DiSC Management” are registered trademarks of John Wiley & Sons, Inc.